Has 2 Slide-outs. 2000 Watt Inverter. 330 HP CAT Engine with Allison 6-Speed Transmission. 7500 ONAN Diesel Generator with 500+ Hours. Low Mileage 38,000+. AIR RIDE Suspension all around. Air Brakes. Exhaust Brake. Automatic Leveling. 2 - 13,500 Ducted Air Roof Units as well as Dash Air Conditioning. 28,000 BTU Furnace. Washer/Dryer Combo. 4 Door EXTRA LARGE Refrigerator with Ice Maker. Convection Microwave Oven. DSI 10 Gal Gas/Electric Water heater. 3 TV's - Living area, Bedroom & Outside in bay. NEW Satellite System with automatic Location System. Rear Back-up Camera with Sound. 8-Way Power ALL LEATHER SEATS. 2 Couches, Dining Area has Table & Chairs. Heated Power Mirrors. Outside Shower. Air Horns. Power Sun Shades. Large Bath with Glass Shower ENCLOSURE, China toilet. Automatic 25' Electric Awning with Aluminum Wrap. Awning over Door. Window Metal Wrapped Awnings/Shades all Around. Metal wrapped slide-out toppers. Day/Night Shades. Lots of cabinet storage. Mirrored closet. Privacy Door for Bedroom. Queen Size Bed with Pillow Top Mattress. Tile Kitchen & Bath. All Corian Counter Tops. Windshield has no Chips or Cracks. Rear Ladder. Trailer hitch with Rock Guard for Towing. ALCOA 22.5" Aluminum wheels with 6 BRAND NEW Michelin Tires. New Starting & House batteries. All owner's books & manuals included. Leveling blocks & much more. 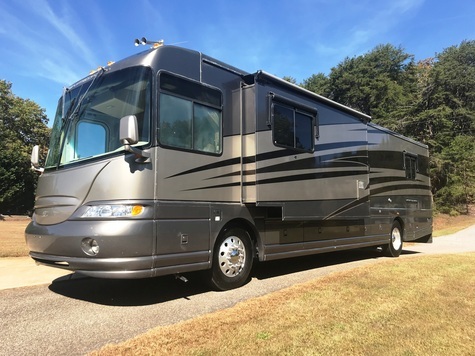 This motor home is a one owner purchased from Mid-State RV in Byron, GA in 2003. Has been kept under cover all its life. Roof is in great condition. No decal fade or peel. Was meticulously cared for. This coach is SQUEAKY-CLEAN inside & out. Shows only minor wear. Non-smoker. Had 1 small dog. No pet smell. On a scale of 1 to 10 this coach is a 9.